American Girl Debuts WellieWishers(TM) -- A New Content And Doll Lifestyle Brand For Younger Girls Ages 5 To 7 | Mattel Inc.
MIDDLETON, Wis. -- Today little girls everywhere will learn what it means to "stand in another person's wellies" with American Girl's new WellieWishers—a line of five fun-loving characters—Willa, Kendall, Ashlyn, Emerson, and Camille—who are out to make the world a kinder, friendlier place. As a lifelong and trusted partner to parents, American Girl created WellieWishers to help younger girls, ages 5-7, discover the social and emotional skills they need to become empathetic, compassionate, and thoughtfully motivated individuals. Timeless life lessons on sharing, cooperation, respecting feelings, and making things right are passed along to girls through each WellieWishers character, who navigates the ins and outs of friendship through play, songs, and imagination. "Recent research shows what moms and American Girl have championed for years—that helping young children develop social and emotional skills is one of the most important things we can do to help them achieve lifelong happiness and success," says Katy Dickson, president of American Girl. "The WellieWishers celebrate an amazing time in a young girl's life when she's learning about herself through the world around her, and we're proud to partner with parents to help their daughters make good choices today that will ultimately define the person and friend she'll become tomorrow." The beautiful, whimsically illustrated early chapter books about the WellieWishers' fun and fanciful outdoor adventures are written with humor and heart by American Girl author Valerie Tripp. A key advisor in shaping and creating the WellieWishers' concept, Ms. Tripp loved using her 40+ years of writing experience for readers ages 2-10, as well as her academic background (BA in Child Psychology from Yale; master's in Education from Harvard) and deep affection for this age group to bring the energetic, earnest, imaginative WellieWishers characters and their world to life. The stories will delight girls and their mothers as they celebrate the promise and potential of young readers and gently model the life skills that help build strength of character and confidence. The WellieWishers' adventures and lessons further unfold in American Girl's first-ever animated series, airing in fall 2016. Each 11-minute episode follows the fun-filled exploits of the five smart and lively six-year-olds, who have limitless imaginations and the same big wish: to be a good friend. When the WellieWishers step into their colorful rain boots, they are ready for anything in their aunt's whimsical backyard garden. Young viewers are entertained through stories, humor, and catchy songs as the WellieWishers work, dream, and play together—feeding birds, making mud pies, creating art, and putting on shows—all while imparting valuable lessons in friendship. To further engage girls and bring the characters to life, American Girl is debuting a free WellieWishers app, where players can explore the interactive garden world through three mini games—Carrot Care, Mud Pie Maker, and Garden Harmony. Little girls will delight in the sweet, silly, and unexpected surprises that get unlocked the more they play. The free app is available through play.americangirl.com. Rounding out the play experience is a line of adorable 14½-inch dolls (retail $60) and garden-themed accessories, including a magical theater stage and a premium wooden playhouse with over 30 pieces. Young girls can even dress like their favorite character with a selection of dress-like-your-doll clothing, like enchanted garden PJs or a pair of peek-a-boo wellies. The WellieWishers collection is available June 23 through American Girl's catalogue, at americangirl.com, and at all American Girl retail locations nationwide. Also on June 23, American Girl stores are hosting special WellieWishers launch events, where young girls can get a first look at the full product collection and the new interactive WellieWishers in-store experience, plus enjoy colorful crafts and a fun photo opportunity. Girls can also take part in free and paid WellieWishers-related events throughout the year. For more details on the in-store events, visit americangirl.com/stores. American Girl is a premium brand for and about girls and a wholly-owned subsidiary of Mattel, Inc. (NASDAQ:MAT, mattel.com), the worldwide leader in the design, manufacture, and marketing of toys and family products. Headquartered in Middleton, WI, American Girl offers an inspiring world of dolls, experiences, and entertainment to empower and unite girls of all ages. Best-selling lines include Truly Me™, Girl of the Year™, Bitty Baby™, and the classic historical character line BeForever™. 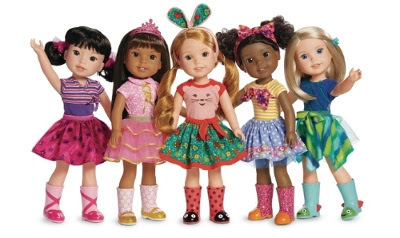 The company sells products through its award-winning catalogue, on americangirl.com, in its experiential retail stores nationwide, and in specialty boutiques at select Indigo™ and Chapters™ in Canada and ElPalacio de Hierro locations in Mexico City. American Girl's mission is to fuel belonging and connection among girls, a goal that has already earned the loyalty of millions and the praise and trust of their parents and educators.